The Global Volcanism Program has no activity reports for Zimina. The Global Volcanism Program has no Weekly Reports available for Zimina. The Global Volcanism Program has no Bulletin Reports available for Zimina. The eroded twin stratovolcanoes of Ostraya and Ovalnaya Zimina form a ridge north of the Udina complex at the SE end of the Kliuchevskaya volcano group. The larger Ovalnaya Zimina, on the W side of the complex, is capped by a large icecap and contains two summits. The extensively eroded Ostraya Zimina to the E has a sharp-peaked summit spire. A large debris avalanche from Ovalnaya Zimina traveled more than 10 km. No historical eruptions have occurred from these volcanoes. Ponomareva V V, Melekestsev I V, Dirksen O V, 2006. Sector collapses and large landslides on late Pleistocene-Holocene volcanoes in Kamchatka, Russia. J. Volcanol. Geotherm. Res., 158: 117-138. The Global Volcanism Program is not aware of any Holocene eruptions from Zimina. If this volcano has had large eruptions (VEI >= 4) prior to 10,000 years ago, information might be found on the Zimina page in the LaMEVE (Large Magnitude Explosive Volcanic Eruptions) database, a part of the Volcano Global Risk Identification and Analysis Project (VOGRIPA). There is no Deformation History data available for Zimina. There is no Emissions History data available for Zimina. This dramatic photo looks north along the cluster of large stratovolcanoes forming the Kliuchevskaya volcano group. Udina volcano (foreground) and the twin Zimina volcano (middle right) are Holocene centers without historical eruptions. 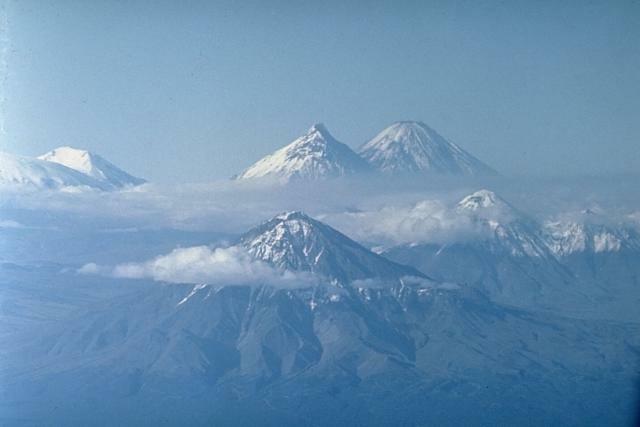 Kamen volcano (top center) and Kliuchevskoi (top right) are Kamchatka's two highest peaks. Ushkovsky volcano (top left) lies at the NW end of the volcano group and has had a single historical eruption. Bezymianny volcano is hidden by clouds below Kamen. Zimina (left) and Udina (center) volcanoes rise to the south beyond a dark-colored lava flow from an active 1990 lava dome at Bezymianny volcano. The larger of two stratovolcanoes forming Zimina volcano, 3081-m-high Ovalnaya Zimina, is visible in this photo; the extensively eroded Ostraya Zimina is out of view to the SE. Udina volcano also consists of two twin stratovolcanoes; the lower SE cone is hidden behind Ovalnaya Zimina. 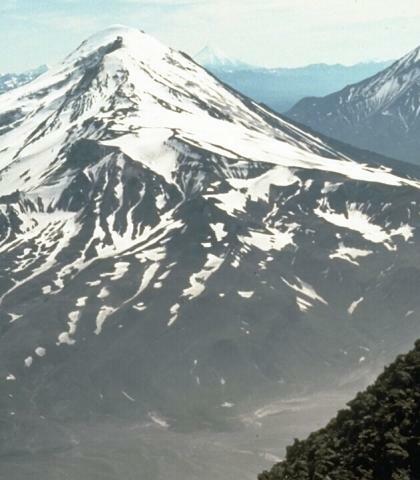 Zimina and Udina are the only major volcanoes of the Kliuchevskoi volcano group without historical eruptions. 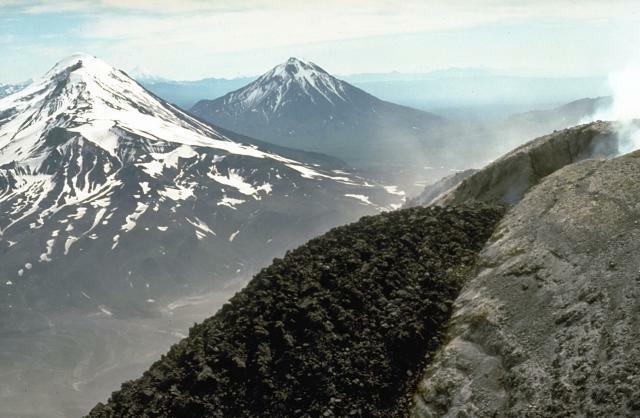 The eroded twin stratovolcanoes of Ostraya and Ovalnaya Zimina form a NW-SE-trending ridge north of the Udina complex at the SE end of the Kliuchevskaya volcano group. The larger 3081-m-high Ovalnaya Zimina at the NW end of the complex, seen here from Bezymianny volcano to the north, is topped by a large icecap and contains two summits. The extensively eroded Ostraya Zimina, off the photo to the left, has a sharp-peaked summit spire. No historical eruptions have occurred from the Zimina volcanoes. There are no samples for Zimina in the Smithsonian's NMNH Department of Mineral Sciences Rock and Ore collection. Large Eruptions of Zimina Information about large Quaternary eruptions (VEI >= 4) is cataloged in the Large Magnitude Explosive Volcanic Eruptions (LaMEVE) database of the Volcano Global Risk Identification and Analysis Project (VOGRIPA).